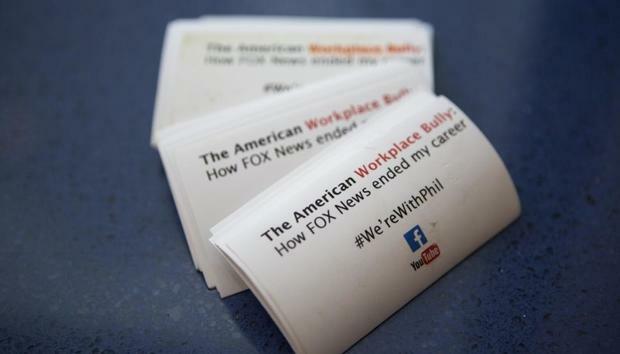 On Monday, just before 9am New York time, a 41-year-old man stood under the Fox sign near the vast imposing entrance of the News Corporation building on Avenue of the Americas in Manhattan handing out business cards. When a security guard asked him to move along… he pulled a handgun out of his jacket and shot himself in the chest. This was Phillip Perea’s carefully coordinated statement suicide to raise awareness about workplace bullying in America. And to get back at former employer Fox News. Around an hour before, he had posted the “The 7th and final chapter of #TheAmericanWorkplaceBully The end...or the beginning” on Twitter with a link back to his YouTube audio serial. “Workplace bulling is not only real, it comes with evidence documented in this series,” he explains in the text and audio videos which detail his dismissal by former employer Fox News in Austin Texas, and run to around eight hours posted in 35 separate instalments. The main narrative of this is edited into a seven chapter overviews (which is also confusingly broken into sections). And in the interests of full disclosure he also posts the full audios secretly recorded during his 10 months employment. Perea was a promotions producer who created advertisement snippets of news features for Fox, and previously other local news stations in the area. It is hard to find any solid detail on his career but he was nominated for several local Emmy awards in 2006 and his Facebook page was mostly updated in 2010 with videos of his work and carries a cover picture of Don Draper from advertising drama, Mad Men. The dispute with Fox News was an extremely complicated affair but the exit interview with manager, Mike, which is covered in the first episode hinges on the fact that Perea brought outside copy into the station (this was to “test” his manager) and “you make some people uncomfortable… they’re afraid of you.” Perea responded with a 100-page rebuttal. Perea is extremely cogent but without studying the audio minutiae in a lot of depth it is hard to tell exactly what is going on. It does seem clear that he very much in the wrong work environment for him and is not the right fit for management. Yet on a skim listen (I heard around an hour) it is very easy to see both sides of the story. The sheer level of minutiae needed to explain his grievance also highlights the complexity of working environments, difficulty in identifying workplace bullying, and the type of impact all this can have on people’s lives. Nothing is black and white or cut and dried. We all know from personal experience, it is impossible to gauge the tone of any organisation until you’ve been immersed in it for a while. A perfectly innocuous sounding comment from Steve at head office may, for example, demonstrate all kinds of shades of nuance, which would sound bonkers to an outsider but leap out loud and clear to his colleagues. Yet this in itself can lead to its own problems, because nobody wants their workplace to be held hostage to over-sensitive workers with an axe to grind. Whatever the truth on this occasion, Perea felt so passionately wronged he killed himself to make his point. “2014 was the worst year of my life,” he says in his final video “It’s time for Fox News to have the worst year of its existence”. This is a cause vs. the corporate machine and every “righteous cause demands a martyr”. “Which side will be victorious? It will be up to you, the people,” he concludes in the description of his final YouTube video.